Promotional jigsaw puzzles are great for your invitations, greeting and thank you cards! 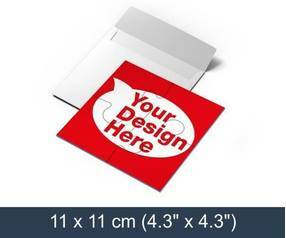 Upload your photo, artwork, design, message or logo to make a promotional jigsaw puzzle. You can make promotional jigsaws from three different materials - cardboard, plastic or with magnetic surface. Each puzzle is packed into an white, blank envelope. Choose from two different puzzle sizes and from four different piece counts. Promotional jigsaw puzzles are available in two sizes, they fit into a regular envelope and can be cut into 4, 6, 9 or 15 pieces. Promotional jigsaw puzzles will be ideal as invitations for your upcoming birthday or wedding. At PuzzlesPrint you have the freedom to make a jigsaw puzzle as you wish using your own image, artwork or design. 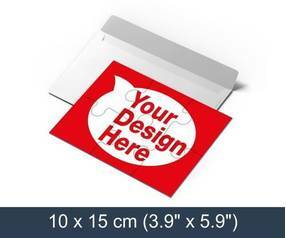 Select material, size, piece count and upload your photo or design to make a promotional jigsaw! Three different puzzle materials to choose from! We offer you to choose from what material you would like your promotional jigsaw puzzles to be made. We can make the jigsaw puzzles out of cardboard, plastic or with a magnetic surface. It is up to you to select the one that suits your need the best. Make the occasion special with promotional jigsaw puzzles! With promotional jigsaws your invitations and greeting cards will stand out. People who will receive these puzzles will be pleasantly surprised. They will enjoy to solve these little jigsaws puzzles, and if you make them magnetic they may even place the puzzles on a metallic surface such as fridge. Promote your services and products! Promotional jigsaw puzzles are great for your business. With these little jigsaw puzzles you can easily grab you business partners, customers or future customers attention. When they solve the puzzle they will be reminded of services or products you sell or provide!